Redefining lever-operated hoists, the CM Tornado 360º features the revolutionary Sidewinder lever handle that allows for efficient operation in both lifting and pulling applications. Ergonomically designed for increased safety, the patent-pending CM Tornado 360º lets the operator to work up to 12x faster and with as much as 30% less pull force than with conventional ratchet lever tools. This first-of-its-kind lever handle design will revolutionize the ratchet lever hoist industry. Its unique foldable handle and 360º rotating lever increases productivity while reducing the risk of operator injury. For quick take up and positioning of slack chain--even with one hand. Designed not to accidently free chain while under load. 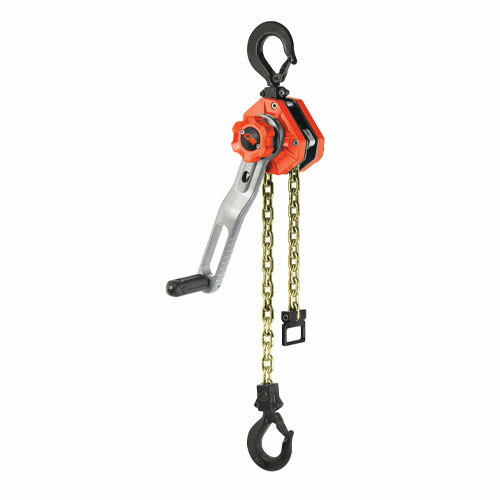 Cast chain end stop allows the user to easily position the chain in free-chaining mode and prevents it from entering the liftwheel and jamming the hoist. Enclosed Weston-type brake stays clean and dry for precise load positioning. Lightweight aluminum housing withstands rigorous use and features high-quality, long-lasting bearings. Powder coat finish provides extra protection in harsh environments. Robust chain guide and chain stripper made from cast steel and zinc-plated for corrosion protection. Bolt-on hooks with nylon locks help users comply with ASME B30.21 and B30.10 inspection requirements. Hooks are forged, allowing them to yield under overload without breaking. Cast safety latches provide positive and secure load engagement. CM's lifetime warranty on all mechanical components, including the Sidewinder lever handle, is the industry's best warranty against manufacturing and material defects. With their 3-year brake warranty, if the brake discs wear out within 3 years from the date of purchase, CM will replace the ratchet disc assembly free of charge. Each unit has a unique serial number for easy and accurate identification.